according to old wives tales, babies should not wear shoes before they learn how to walk... thus i have been holding back on buying shoes for princess. but since she has been cruising with furniture for a while now, my friends all say that already 'qualifies' as walking so today is the 1st time she 'officially' wears shoes when we go out. it wasn't long before she started to 'complain' - and started kicking off her shoes. now i remember why i don't even let her wear socks - coz she ends up 'losing' them... luckily i'm constantly alert and almost always realises when they are 'missing' otherwise i'm practically throwing $$$ away - considering how expensive baby's shoes and socks are! 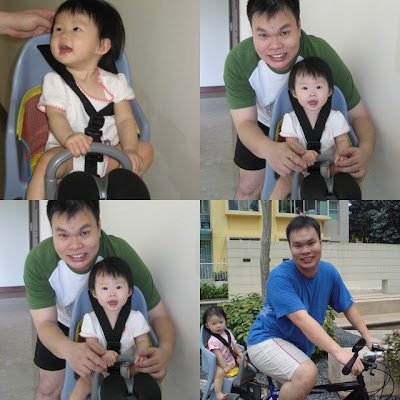 notice how stress baby looks on her 1st bicycle ride? side note: baby's 1st tooth finally erupted today! - climb onto her rocking puppy on her own! - cry when we scold her - nowadays the crying has turned into a 'saccharine sweet smile' in an attempt to melt our heart & stop being angry with her. wonder where she learnt that from? adventurous as we are, plans were made to take little princess to kuala lumpur more than a month back - i say that because claire absolutely HATES car rides - for one thing, she cannot be in the same place for too long; boredom never fails to set in. on top of that, she HATES being strapped in the car seat. i'm glad we made it there and back - i guess it all just boils down to proper planning.